This is the extraordinary autobiographical story of one family's faith in the face of crisis; a true testament of courage, determination, forgiveness and love. 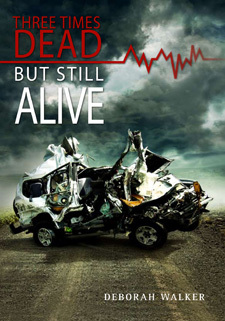 Surviving a horrific motor vehicle accident, they can witness that God is found in the deepest valley. Three Times Dead and Still Alive is an inspirational story that will challenge you to think differently about your trials and strengthen your walk with God. All things are possible. Only believe. Deborah Walker is a writer, song writer and musician. She began writing this book while still hospitalised after the accident, so that she could share the story of God's grace and what He has done for her and her family. She lives in New Zealand and has been a committed Christian all her life.